FA: Zach Lee and Joe French, 2/16/08. Ascends the crack system up the south face of Johnson Mountain’s southern most summit. This route and Force Boyle are both equipped with bomber hardware and chain anchors. 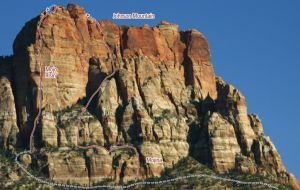 This is an enjoyable and challenging route, good to do during the colder months of the year. Which SuperTopo guidebooks include a topo for Tree House of Horror?